Plano author Lorraine Heath, author of more than sixty (yes, sixty!) 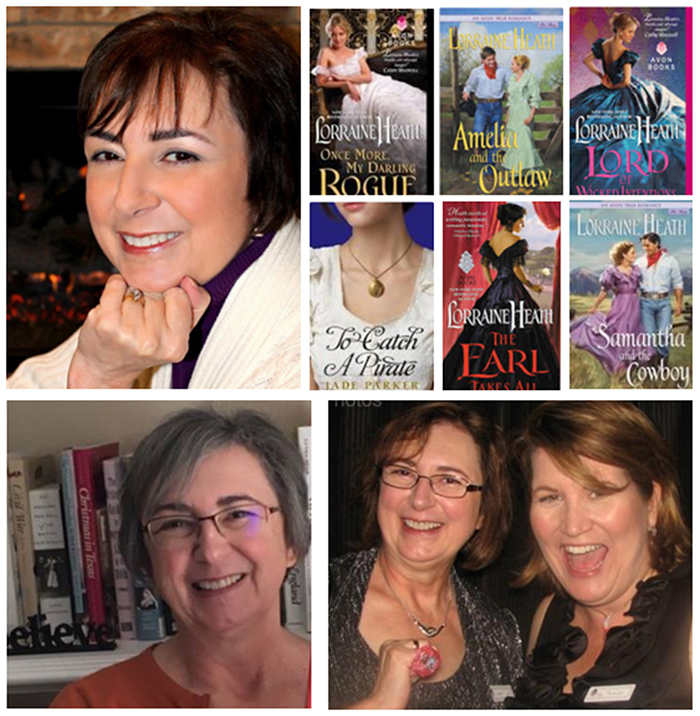 novels, writes historical and contemporary romance for adults and historical romance for teen readers. Under the names Rachel HawthorneJade Parker, she writes popular contemporary, historical, and paranormal romance for teen readers. She also writes young adult novels with her son under the name J. A. London. Her work has also been recognized with many top awards and recognitions. We caught up with her via email for this week’s Lone Star Listens. LONE STAR LITERARY LIFE: I understand that you were born in England, Lorraine, but moved to Texas when you were young. How would you describe your “home town” and your growing-up days, and how do you think they influenced your writing later in life? LORRAINE HEATH: I grew up in a small town south of Houston, population 10,000. We lived on the outskirts of town, on an acre and a half of land with very few neighbors. The bus I rode to school would go out even further than we lived, to a more rural area to pick up students. It was a quaint town. My dad was a business owner who taught us to support local businesses. We had one middle school and one high school. Football ruled. Because none of my friends from school lived where we did, I spent a lot of time in my room daydreaming and writing, entertaining myself with stories in my head. You attended the University of Texas in Austin in the late 1970s. What was that like for you? It was an intense cultural and social shift. There were more students at UT than there were people in my hometown. I was exposed to such a wide variety of people: military kids who had traveled, students who had gone to much larger schools and seemed far more sophisticated than I was, students much smarter than I was, with more life experiences, students from other countries. I was like a sponge, just absorbing it all. I’ve always been more of listener than a talker, and I was captivated by the glimpses I got into lives that were so different from mine. After graduating from college, you went to work for the IRS — an interesting career choice! — but it wasn't too long before you tried your hand at fiction. Did you always want to write? When did the writing bug bite you? I graduated from the University of Texas with a degree in psychology, which doesn’t really prepare you for the job market, so I found myself working for the IRS, first as a tax examiner and later as a training specialist. I have always wanted to write stories. I remember being about seven or so and sitting in my bedroom with a red Big Chief tablet and writing a story about a man who fell in love with a mermaid. I wrote in a diary, wrote letters to relatives. As long as I was scribbling words, I was happy. But I wasn’t applying myself toward achieving the goal of finishing a story and seeking publication. When I became a training specialist at IRS, one of my duties was to write training manuals. I wanted to excel at being a technical writer so I signed up for a technical writing class at the local community college. The first night of class, the instructor asked us to introduce ourselves by sharing what we would do if money were no object. I said I’d buy a house in the hill country with a second floor that had windows all around it so I could look out over the hill country and write stories. Driving home from the class, it struck me that if that was my answer then I needed to start doing it. So when I got home, I pulled out my typewriter and started writing a story. It wouldn’t get finished. Life got in the way for a few years, but it did reignite my desire to write stories, and I started storing ideas away. Can you tell us what your first big break as an author was like? My first big break happened twenty-five years ago this year, Feb. 27, when I got THE call from my agent letting me know an editor was interested in buying my book. It was exciting and scary. Berkley wanted to buy it for their Homespun line, and I had no idea what the books in the Homespun line were like, if I wanted to be associated with them. I told my agent that I would get back to her to let her know if I wanted to accept the offer. Then I jumped in the car, raced to the bookstore and scoured the shelves for some Homespun titles. Bought three, took them home, read the first chapter of each, called my agent back and told her to accept the offer. I’d be thrilled to have my book included in the Homespun line. Then I spent the remainder of the night dancing around the house. If readers aren’t familiar with your work, which of your books should they start with, and why? You’re asking me to pick one of my children, but I would probably suggest they start with In Bed with the Devil. This is the first book in the Scoundrels of St. James series, and it seems to have struck a chord with a lot of readers. The characters in this series sometimes make cameo appearances in later series or books. Although all of my stories are self-contained and do stand alone even if they are part of a series. I want readers to be able to read my books in any order and not feel lost. When I started publishing, we didn’t have e-books. Books went out of print. Now with e-books, books can remain available forever. In addition independently publishing your work wasn’t a viable option for authors so that’s provided some creative freedom for many authors. How has romance writing changed since you started? The romance genre has broadened the types of stories available for readers. When I first started writing, everything was pretty much historical or contemporary. Now we have paranormal, inspirational, romantic suspense, fantasy romance, light romance, dark romance and more. I think almost anyone could find a romance that suits his or her reading taste. I also think the stories are much faster paced than they were thirty years ago, and they tend to take place in a much shorter period of time, whereas the early romance novels tended to have more of a saga feel to them. What do you consider the elements of a successful romance novel? First and foremost, you have to have a happy ending. If you don’t have a happy ending, you don’t have a romance. You also need a hero and heroine who are respectful of each other. They can argue, get on each other’s nerves, but they have to do it in such a way that there is no doubt that at their core they are decent people. I think you can have flawed characters, but not weak characters. Often a character might not realize the strength within, but the reader should be able to see it from the start. A successful romance needs to draw the reader into the characters’ lives and hold them there, laughing and crying and rapidly turning pages, until they get to the end where they can sigh with satisfaction as the characters ride off into the sunset. Who are some of your favorite Texas romance novelists? Sophie Jordan, Kerrelyn Sparks, Jodi Thomas, Sherry Thomas, Cathy Maxwell (a recent transplant from Virginia, whom we’ll make a Texan out of yet). Now, I am going to ask you the same question that I ask every romance novelist that I interview. To you, what is the most romantic place in Texas? The Littlefield Fountain in front of the University of Texas Tower, because that’s where my husband first kissed me when we were students at UT.